This rather pretty popcorn maker from Judge Cookware arrived a couple of weeks back. 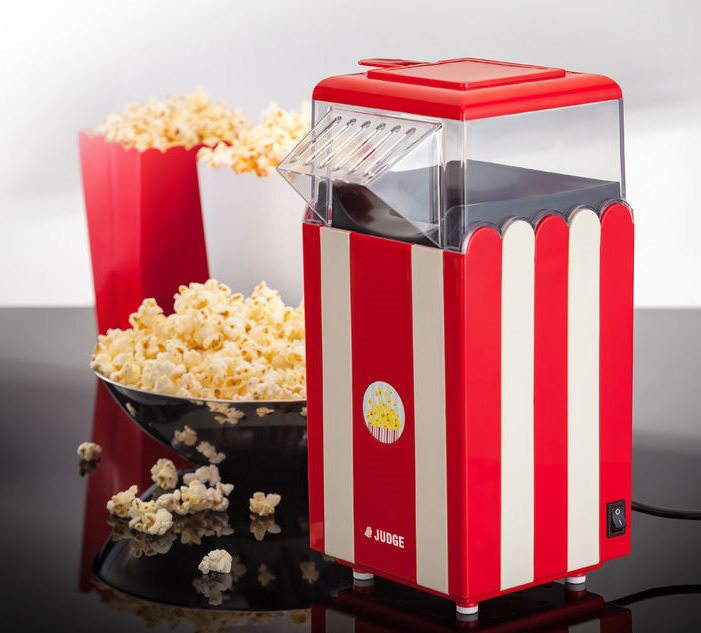 With a fun retro design, the Judge Popcorn Maker allows you to enjoy fresh, crunchy popcorn in a matter of minutes. All you need to do is, plug in the popcorn maker, measure the kernels using the measurement cup and pour it into the main body. Turn on the popcorn maker and wait for the popping to begin. The popcorn is air popped, so you need not add any oil or butter. You can however melt a little butter in the measurement tray provided and then season it as per taste. Care needs to be taken that the butter doesn't enter the main popping chamber as this could damage the machine. Once you have flicked the on/off switch to turn the popcorn maker on, the corn kernels start to pop - popping out of the machine into the bowl which you would have placed under the shoot of the popping chamber cover. Once the kernels have stopped popping turn the machine off. If there any un-popped kernels, remove them and use them in the next round of popping. Here are some of the ways I seasoned freshly made popcorn. Hot Chilli Butter Popcorn : Melt 3 tablespoons of salted butter, add finely chopped Indian green chillies (1-2), mix well and drizzle over the popcorn. If green chillies are too hot for your liking replace it with red chilli powder. Sweet, Spicy and Tangy Popcorn : This one was a wonderful mix of flavours. Combine 2 tsps. of red chilli powder, 1/2 tsp brown sugar and 1 tsp of lime zest. Drizzle the popcorn with Olive oil and then add the seasoning mix. Toss well and serve. Honey Barbeque Popcorn : This one was the easiest of the lot. Take a bowl of plain popcorn and a bottle of Honey Barbeque Glaze (I used the Jack Daniel's Tennessee Honey Barbeque Glaze that arrived in the May Degustabox). Drizzle the glaze over the popcorn and toss to coat. Serve. The Judge Popcorn Maker is a great little machine. We have had it for around two weeks now and I have already put it to a lot of use. It is very easy to use and you have a fresh bowl of popcorn in a couple of minutes. You can watch this video for a demo on how to use the popcorn maker.